After managing to survive the initial onslaught of the Angel apocalypse through an unlikely alliance with the enemy, Penryn finds herself, along with other survivors trying to salvage some semblance of a normal life camped out with the resistance a group of civilians set on taking down the Angelic invaders. When a group of people capture Penryn’s sister Paige thinking she is a monster the spectacle leads the newly created scorpion/locusts hybrids to the survivors. In the ensuing chaos Paige escapes, leaving Penryn and her schizophrenic mother searching the streets of San Francisco to find her. Meanwhile Archangel Raffe (Raphael) believing Penryn dead continues to search for the fallen Angel Beliel in order to seek vengeance and get back his wings. As the story unfolds Penryn makes some shocking discoveries about the Angel’s plans and privately longs to reunite with Raffe. World After the second book in the Penryn and the End of Days series proves that Susan Ee is most definitely not suffering from the sophomore slump. This is one of the best follow ups to a great first novel I’ve read in a long time. Picking up right where the first book left off, World After doesn’t feel like a sequel because it flows so seamlessly – Penryn’s story is so perfectly laid out, Ee ensures you remember how the first book panned out without rehashing everything. Even better is that this series truly sets itself apart from the other major female led, dystopian/apocalypse/fantasy series out there and that comes down to Penryn. Penryn puts other major female heroines (Katniss, Tris, etc) to shame she’s neither so tough and self-righteous that you can’t identify with her, nor does she complain about her current lot in life. She is unapologetic for the things she’s forced to do to survive as she navigates this new, apocalyptic, angel run world. Penryn’s sense of self-preservation knows no bounds – she will do whatever it takes to protect her little sister and her mother. She is a perfect mixture of vulnerability and steeliness. In the first book Angelfall a big part of the story revolved around the relationship between Penryn and angel Raffe. In World After Archangel Raffe doesn’t make a proper appearance until more than halfway through the book. A great choice on Ee’s part – this is Penryn’s story and though Raffe is a great character (I mean he is particularly swoon worthy) she’s not allowing him to become Penryn’s sole purpose for survival, nor is she allowing her to become dependent on him, either physically or emotionally. That being said I found myself waiting with bated breath for their reunion – Raffe despite his incredible piety and status as an Archangel is slowly but surely developing a great sense of humanity, his interactions with Penryn, their connection and the feelings he has for her that he never truly acknowledges nor denies only makes him more accessible and real as a character. Though it’s obvious Penryn and Raffe have feelings for each other (I mean holy chemistry Batman!) Penryn never allows herself to become so wrapped up in Raffe that she forgets what she needs to do or what she’s capable of. Part of what makes their relationship so great is that despite Raffe’s otherworldliness he treats Penryn as an equal – because he knows she’s got his back. I love that when Ee creates these intense moments between Penryn and Raffe – with all this unspoken subtext Penryn always finds a way to remind herself of what’s important – survival and protecting her sister. She gets these great moments of being a teenage girl but never dwells because she knows at the moment there’s more important things to deal with. Ee creates a broad range of interesting and unique characters, deeply entrenched in the realism of the world she’s created. Through Penryn’s little sister, Paige who despite being “Frankensteined” maintains her sweetness and love for her sister while dealing with her newly developed savagery, their mother who in her paranoid schizophrenic state demonstrates more clarity and know how than those of sound mine, and the members of the resistance exhibit both the good and bad of human behaviour this new, dark, and cold world takes shape. Ee weaves numerous stories into the fabric of Penryn’s overall tale – the resistance, her mother’s struggle with mental illness and Paige’s struggle with her new form only enrich the story. The Angels and their fight to be messenger – the mixture of power, politics and heavenly bodies heightens the drama and adds a sense of urgency to the fight. *Slight spoiler* the creation of the locusts to act as a sign of the apocalypse to help push for the angels agenda and dominate the world is a really great, unexpected twist. Ee’s appropriation of Christian angelic hierarchy and the new elements she’s created (the warrior’s connection to their sword, the lightness of angels despite their power, their regenerative powers) adds to the angelic folklore we already know. Ee is a great storyteller, she’s creating a world that readers can identify with and get lost in, with strong characters – and particularly a great lead it’s no wonder she’s become a self-publishing phenomenon. 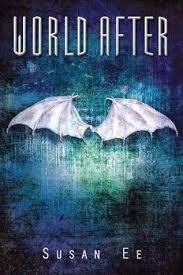 Also, little side note here, the book covers for both Angelfall and World After are amazing – dark, dangerous and beautiful they offer a perfect, wordless explanation of what to expect when picking up these books. Susan Ee’s Penryn and the End of Days series is shaping up to be a great addition to the YA fantasy/dystopian canon – it’s a fascinating story with the right amount of edge, fantasy and romance. I highly recommend it. "Words, words. They're all we have to go on." - Tom Stoppard, "Rosencrantz and Guildenstern Are Dead"